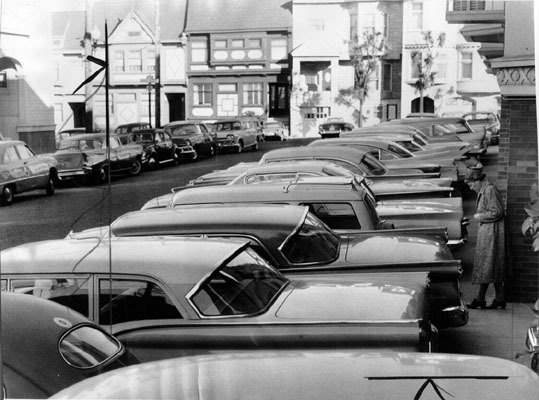 Title [Automobiles illegally parked across sidewalk at Hugo street, near Arguello] [graphic]. Reproduction Rights Permission to use this image must be obtained from the San Francisco History Center, San Francisco Public Library. S. F. News-Call photo by Geo Place. Notes Newscopy: "What would you do if somebody passed the word that on a certain hour of a given day some 40,000 automobiles would be plunked down in your already overcrowded neighborhood! A hypothetical question, you say? Not me, as some of your fellow-citizens know only too well from--often grim--personal experience. Like the ones whose homes happen to stand within a mile or so from Kezar Stadium. NOW, WHEN you're a football fan, that's a convenient spot to live. Apart from the fact that you don't need a care to take you to the game these days, junior can pick up a fast buck by squeezing a desperate spectator's machine in your garage at a program parking rate...".